It was a very fine day, and a very busy one. I started at 0900 (9:00 am) with my Albany 3-1/2 Mile walk, and ended at 1830 (6:30 pm) giving presentations on Mount 31 (the 3" Gun Mount on the Forecastle, pointy front end of the ship). Today, no one joined me on my downtown walk. But, I did run into a few visitors along the way. On a Sunday Morning there are few places open in downtown Albany so I gave each group a little tour. I gave a brief over view of the Visitor Center, Albany Pump Station, and the Quackenbush House to one group. I saw the 2nd group a little later and gave an overview of the Empire State Plaza and the NY State Capital. A little later I saw both groups aboard the Slater. The highlight of my day was giving a tour to a family that brought their family patriarch to tour the ship. He was a WWII Merchant Mariner. If he was 18 when he served he would be 88 today. He had a little trouble speaking, but managed to walk the full tour. It was very appropriate to give this tour on June 19th (it was both Father's Day and National Maritime Day). Here's a link to a slide show about the local observance of National Maritime Day in the Albany Times Union. ".....I am glad of an opportunity to send a Maritime Day message to the American people. Today, as never before in our history, our Merchant Marine is vital to our national welfare. I do not mean vital merely in the conventional sense that it makes an important contribution but in the stranger sense that it is a crucially decisive factor in our continued existence as a free people. If we are going to keep away from our shores the forces that have convulsed the Old World and now menace the New, the job will be done in large measure by the ships and the sailors of the Merchant Marine and by the working men who build the ships and supply them. If they fail, the whole effort fails. And earnest, hardworking Americans, who spend the best part of their lives providing for the security and happiness of those they love, know that precious security and happiness depend exactly on the success of that effort. I know the effort will not fail; that more and faster ships will be built, manned by trained American seamen, and that they will carry through the open waters of the Seven Seas implements that will help destroy the menace to free peoples everywhere. Very sincerely yours, - (Signed) FRANKLIN D. ROOSEVELT....."
During World War II, Over 1,500 ships were sunk, with 1 in 8 mariners losing their ship. Casualties were kept secret during the war to avoid providing information to the enemy and to keep mariners at sea (source: US Merchant Marine made victory possible). During the tour our WWII Merchant Mariner noted that he started the War serving on Panamanian Flagged Ship. After December 7th the ship was re-flagged as a United States Ship. I managed to dig out a this relevant link: Yank Sailors on Foreign Flag Ships. He also noted that he made a Murmansk Run in March of 1942. 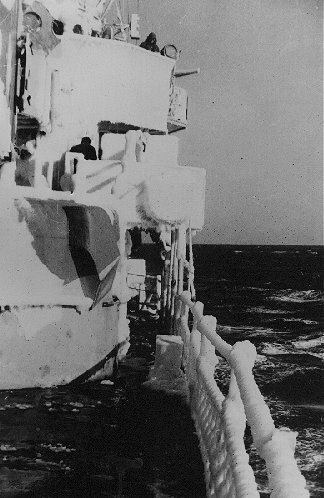 For a Merchant Mariner 1942 was probably the worst year, and the Murmansk Convoy was the worst place to be. Here is a Wikipedia link on Arctic convoys. There were three Murmansk Convoys in March of 1942: PQ12, PQ13 and PQ14. None of these convoys were pleasure cruises, but the worst was probably PQ13. There are a few detail stories about this convoy. One is the story of the loss of the British Ship SS Induna. Chapter II of the History of the Naval Armed Guard Afloat (OP-414) covers PQ13 in detail.